On August 4, 2017, King Felipe VI, Queen Letizia and Former Queen Sofia of Spain attended the traditional summer reception held for Authorities of the Balearic Islands at the Almudaina Palace in Palma de Mallorca, Spain. Like the shoes. Like the dress. Maybe not together? I feel the same. those shoes are KILLLER. But don't go with the summery feel of the dress. The embrodery is typical of "mantón de Manila". It is an spanish traditional shawl that women wear in special events. It is made of silk with an embrodery of flowers. The Queen's dress embrodery is really beautiful. Both queens have very pretty summer outfits. The flowers make you want to smile! I do love the way Letizia and Sofia interact with each other, so affectionate and respectful. Felipe is a lucky man! Gorgeous dress and I love her shoes too with the dress. 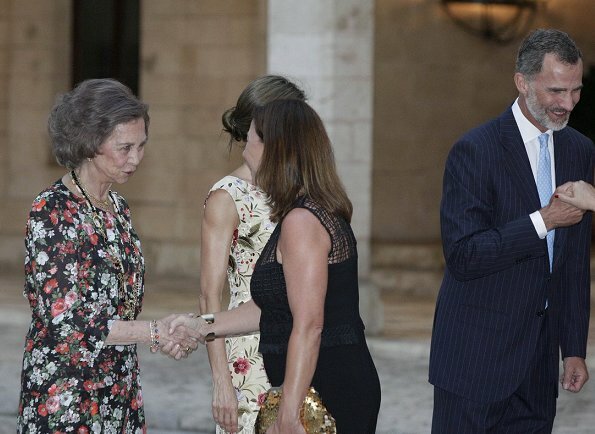 Letitia looks lovely and I love the interaction between her and her husband and Queen Sofia. Yes, all three look amazing. I fall in love with this prints. Flowers are so lovely and summer. She looks fantastic -happy,fit women. I think Letizia's outfit is gorgeous.As well as Sophia's. And the good feeling between both of them is the best of it. Indeed, Queen Felipe is a lucky man. Letizia´s dress is very beautiful. 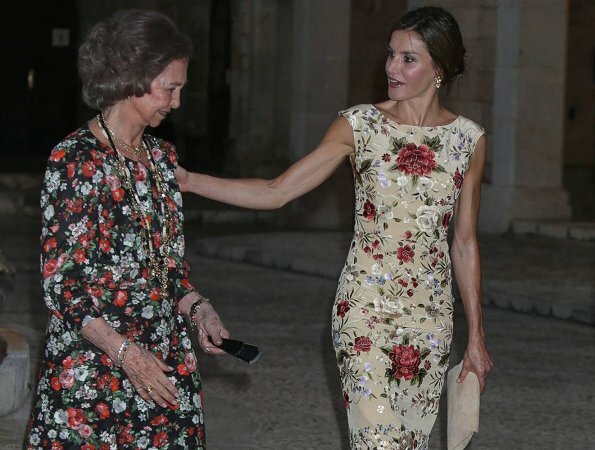 Queen Letizia's dress has gorgeous summer spirit and is extremely elegant. Love Letizia's dress and earrings, the shoes are a tad modern and normally I am not a fan of florals but I love the whole look. The relationship between Queen Sophia and Letizia's is so lovely. she looks fabulous, and her posture is to die for!! My first impulse was to agree that her posture is fabulous. However, after some thought I think the very high heels many women are wearing now are causing an unnatural tilt to their trunk. The fashion of all three royals in these photos is perfection. Los Reyes y Dª Sofía forman un equipo estupendo. 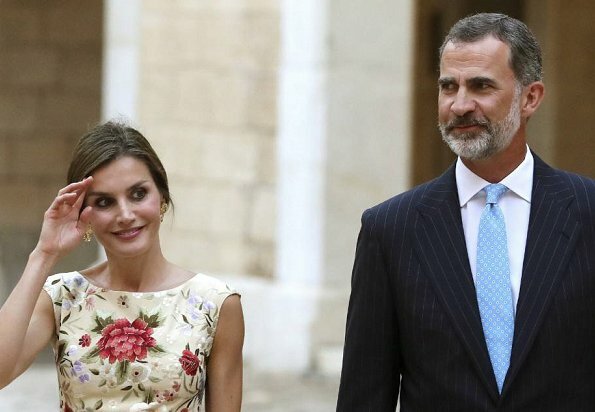 Letizia está preciosa con su vestido floreado como un mantón de Manila, muy español, muy alegre. Bonito moño casual y pendientes nuevos. Beautiful summer outfits, and such a lovely friendship between the two Queens! 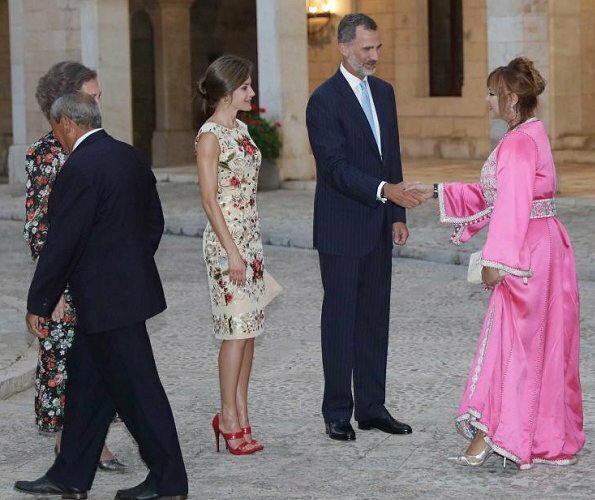 Wow, Letizia hat ein wunderschönes Kleid und die Schuhe passen sehr gut zum Kleid. Eine glückliche Familie - schön zu sehen.